The “Supervalu – Save-A-Lot Facility” is a single tenant industrial building, totaling 253,800 square feet and situated on 24.37 acres. 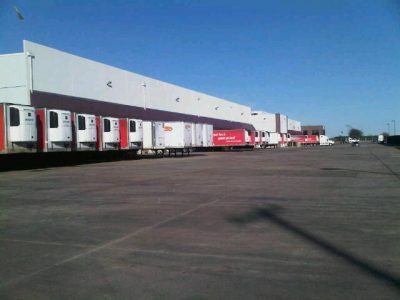 Features include: 32’ clear height, 48 loading docks, and 26% of the facility is refrigerated (41,000 square feet is freezer). The concrete tilt-up project offers 4000 AMP power, an ESFR fire sprinkler system and a secure fenced yard with abundant parking for vehicles and trailers. Well-located with immediate access to Interstate 35W, via Everman Parkway, and less than a mile south of Interstate 820. 8.5 acres of separately titled developable land, of which a portion is fenced and paved for parking/ trailer storage is included with the asset.